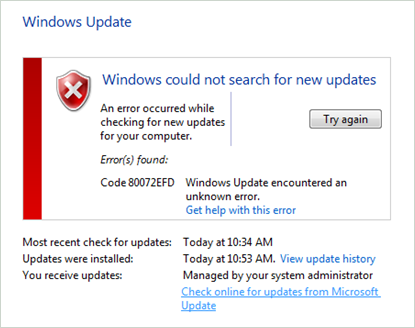 Overview - What is Windows Update Error 80072efd? Windows update error 80072efd is related specifically to downloading and installing windows updates from Microsoft's servers and indicates there is a problem gaining a connection. It is common to see this error message if Microsoft's servers are overloaded with update requests. It can also be seen if third party firewall software or proxy services are interfering with the Internet connection. The main cause for receiving an 80072efd error is due to your computer being unable to communicate with Microsoft's update servers. This could either be because they are down and unavailable or unavailable due to high demand. You could also have trouble connecting to Microsoft's update servers if you are using a third party firewall that is blocking the relevant update ports. A badly configured proxy server can also contribute to receiving this error when your computer attempts to contact Microsoft. In some cases, infection by a virus or malicious software can interfere with the Windows Update process. If this is the case, you may receive a Windows Update Error 80072efd. Busy Servers - If it's the first time you've seen this error, it could be that Microsoft's servers are just busy and unavailable. In this case, simply close Windows Update and try again later. Usually server downtime will last no longer than 10 to 15 minutes. The most likely outcome is the update will succeed at a later time. Firewalls and Proxy Servers - If this error message persists, you may be inadvertently blocking the update process by the use of a firewall or proxy server. Turning off these programs can temporarily verify if this is the case. If the update succeeded with your firewall turned off, you may need to add exceptions to your firewall so Windows Update can operate unhindered in the future. This is particularly true of third party firewalls, as the built in Windows firewall generally has these exceptions already entered by default. Once these URLs are added, retry the windows update with your firewall turned on. Viruses and Malicious Software - Run a complete system scan with your anti-virus and anti-malware software. Repair any problems it may find, and then try the windows update again. Disable all firewalls, anti-malware and anti-virus software temporarily whilst running Windows Update. Make sure you have the latest updates installed for Background Intelligent Transfer Service. If you are attempting to troubleshoot this problem whilst your anti-virus and anti-malware software is switched off, it's recommended that you only access safe and trusted websites, do not use instant messenger services and do not open emails or attachments.